Stunning views of the river, walk or kayak to Oven’s Mouth Preserve, this vintage cabin in the woods has to be seen to be appreciated! Sitting atop a hill, the open deck sticks out almost to the water. You are high up with unimpeded views of the tidal salt-water river. A wooded path leads down the hill to the shared dock and float. You will be amazed by the natural beauty that surrounds you! Across the water from you is Edgecomb. This private, peaceful property is close to town, yet feels very remote. You have found Sunset. Sturgeon and seals call this part of Boothbay home. You will spend your entire week watching the aquatic wildlife from your deck or kayaking out there alongside. This cabin is the perfect location and setting for the adventurous vacationer. THE HOUSE: Sunset is a mid-century Maine-style cabin in the woods. The clapboards are white, the shutters are green. The rooms are smaller but so very sweet. Hardwood floors, four paned windows that prop up with a stick, an adorable dining table with three chairs and a hand-built storage bench. If you didn’t visit your grandparents in a cottage just like this when you were a kid, you missed out! The kitchen has a four-burner stove top with oven, a full sized refrigerator, double sink and plenty of cabinets for you to unpack your supplies and settle right in. The parents’ bedroom has a double bed, the kids’ room has two singles. There is a ¾ Bathroom with a shower as well as a half bath. The open deck wraps half-way around the house with open staircases on both ends. This is truly a place where you can unplug, recharge your batteries and truly spend your vacation relaxing! Cell phone coverage here is spotty, and cable and Internet are not available in this area. The owners have chosen to keep the landscaping very natural. Wild strawberries, lupine, and other indigenous flora and fauna are in abundance. You will truly feel as if you have stepped back in time. The path leading down to the dock winds quickly through the woods and stretches out far enough that even at low tide, you are over deep water. The house comes with a mooring for an additional fee. This is a great spot for boaters! PETS PERMITTED? Dogs only, please, due to owner's severe cat allergy. Please note: Dogs and children are welcome at this cottage and have enjoyed it for generations. However, please be mindful that there is a steep drop from the deck to the ground. The path leading to the water winds its way down to the dock and some may find it difficult to maneuver. Ask your reservation agent for more details if this may be a concern for anyone in your party. We want all of our guests to be happy and safe at our cottages. Seals, sturgeons, osprey, eagles, and heron are what you will be looking for around Sunset cottage. Oven’s Mouth and the Oven’s Mouth Preserve, the reversing falls, an amazing and vibrant salt-water tidal river, with both a covered and an open deck for alfresco dining, and two kayaks are all a part of the experience. This cabin is not for the faint of heart. From the breathtaking views to the simple wooded path to the dock. Use the two kayaks to explore this absolutely pristine stretch of the coast. Enjoy a short walk from your drive way up to the Preserve and the hiking loop there. Bring or rent mountain bikes and explore the miles of dirt roads surrounding your cabin. You will not be bored during your stay at Sunset Cottage! The best part of our rental experience was the helpfulness of Cottage Connection staff. The remodeling the owners have done is very nice. Driving directions and Check-In information will be e-mailed to the guest once they have completed their Guest Occupancy Agreement. SMOKING AND/OR FIREWORKS ARE PROHIBITED ON EVERY PROPERTY MANAGED BY CCM. 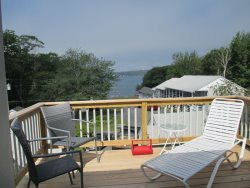 We represent a wide variety of quality vacation rentals throughout the Mid Coast Region of Maine. Individually and privately owned, each vacation rental reflects the taste of its property owners. Every effort has been made to ensure that the descriptions and amenities listed above are accurate. However, occasionally changes are made by the owners to furnishings, amenities, and equipment. Once a change is brought to our attention, we will update that webpage. If you have any specific questions not addressed above or are in search of specific criteria, please contact us.